Here the guides explain that our prayers and our intentions invoke the consciousness of those we call upon who have passed over. … There are different vibrations who come through to communicate… feel the energy shift at 4.20ish.. and 4.50ish…. feel the energy vibration in the centre of your chest. You may also be able to feel loved ones come through to communicate directly with you during the meditation at 5mins and beyond… …there is a big energetic shift in the third eye from 5.44 onwards. They explain that some who have passed over who are too weak in vibration to pass over to the light, may be assisted through our prayers, , In this evenings event every one was asked to call upon someone they loved who had passed over to experience them in meditation. How does the channeling work: As a spiritual healer Lyza originally only let her healing guides work through her forearms, hands and heart in her healing room during sessions with clients. She listens to them as she speaks with her clients and often she is given just one word to say that will create a massive shift within the client, releasing years of grief. Now she also sits and relaxes, allowing her guides to speak through her, allowing them to absorb past her hands and forearms, into her body, pineal gland and throat. They use her third eye for sight and communication, and her throat for expression. 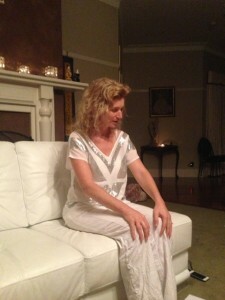 It is an exciting, healing and learning process for everyone involved to watch Lyza work as a Trance Medium.